Reed Criddle: Bio & Choral Music | Santa Barbara Music Publishing, Inc.
Dr. Reed Criddle is Director of Choral Activities at Utah Valley University. 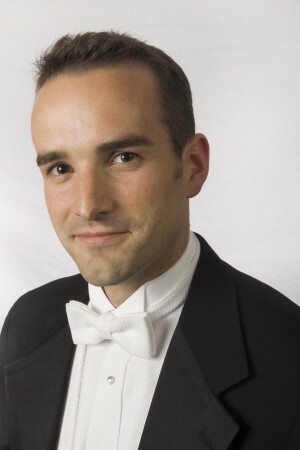 He conducts the Utah Valley University Chamber Choir and Masterworks Chorale, and teaches private voice and conducting. He has also served as conductor of the UVU Symphony Orchestra, UVU Chamber Orchestra, and UVU Women’s Choir. In 2010, Dr. Criddle was named artistic director and conductor of the Wasatch Chorale, UVU’s resident symphonic community chorus. Before his appointment at UVU, Dr. Criddle was Director of Choirs for the Young Musicians Program at the University of California, Berkeley, where he conducted both high school and middle school choruses, and taught voice and advanced music theory. Dr. Criddle completed his Doctorate of Musical Arts in Conducting at the University of Michigan, under Dr. Jerry Blackstone and Dr. Paul Rardin. He has a Masters of Music in Choral Conducting from the Eastman School of Music, where he studied conducting with Dr. William Weinert and Brad Lubman, and voice with Karen Holvik. He has also completed Bachelors of Arts (Music: Vocal Performance; Chinese) and Masters of Arts degrees (East Asian Studies) from Stanford University, studying voice with Jennifer Lane and conducting with Dr. Stephen Sano. In recognition of his excellence as an instructor of conducting at the Eastman Community Music School, Dr. Criddle was awarded the Certificate in Community and College Teaching. In 2012, he was selected to represent the Western Division of ACDA at the US-Cuba Choral Summit and was conductor-in-residence with Sine Nomine, Cuba’s all-male SATB professional choir. In 2007, Dr. Criddle was selected to study conducting with Helmuth Rilling at the Oregon Bach Festival. Additional conducting masterclasses teachers include Chanticleer, Vance George, Joseph Flummerfelt, Ann Howard Jones, Duain Wolfe, and Ragnar Bohlin. Reed Criddle has conducted a variety of collegiate ensembles, such as the University of Michigan Men’s Glee Club, the University of Michigan Orpheus Singers, the Eastman Repertory Singers, the Eastman Women’s Chorus, and the Stanford Chamber Chorale. For the 2009-10 season, Dr. Criddle was chorusmaster for the University of Michigan Opera Program. An advocate for quality musical arts in the community, he has also served as artistic director of the Livingston County Chorale (Brighton, MI), the Taiwanese Choral Society of Rochester (Rochester, NY), the Rochester Mormon Choir, and was Minister of Music at the United Methodist Church of North Chili. Dr. Criddle was additionally chorusmaster for the University of Michigan Life Sciences Orchestra Chorus’ first performance of Beethoven’s Ninth Symphony. Recent concert collaborators include Utah Regional Ballet, UVU Ballroom Team, Utah Valley Symphony, Utah Premier Brass, and UVU visual artists. Dr. Criddle has adjudicated district and state high school choral festivals in Michigan and Utah, and is an active clinician and guest conductor. This season, he will make his Utah Lyric Opera debut, conducting Menotti’s Amahl and the Night Visitors and Handel’s Messiah. His reviews and scholarly articles ranging in topics from ethnomusicology to new choral compositions have been published in the Choral Journal and Asian Music. Reed Criddle has 3 titles published with Santa Barbara.